If you own a mid ’60s Chevy Impala or Caprice, this tech is for you. The engine has to work a little harder on these heavier vehicles. 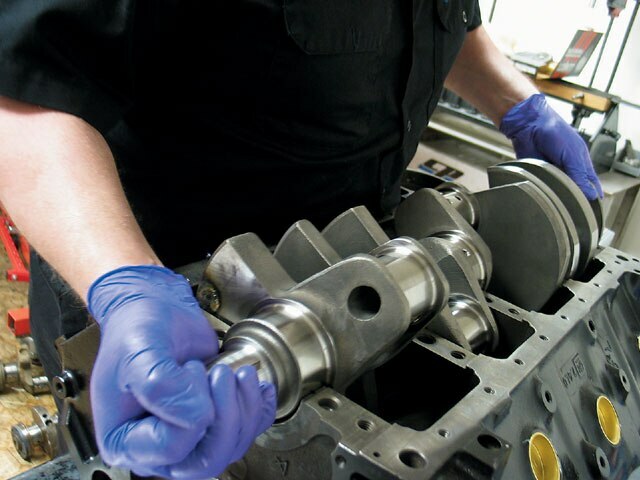 You can compensate with a big-block engine, which will give you more torque and less stress. They will also make the car move a little better; instead of feeling like a sluggish land ship, your heavy Chevy will power along almost like a speedboat. 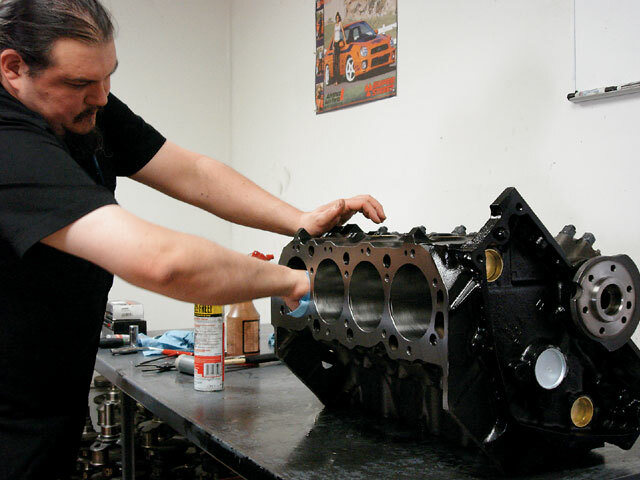 While doing a 350 build, we were talking with Jerry of Ace Machine in Riverside, California, about the different engines and Jerry invited us to come back when he was going to put together a big-block. On the scheduled day, we talked about how people get intimidated by a big-block, but the reality is that it works the same as a small-block with only minor differences in parts. 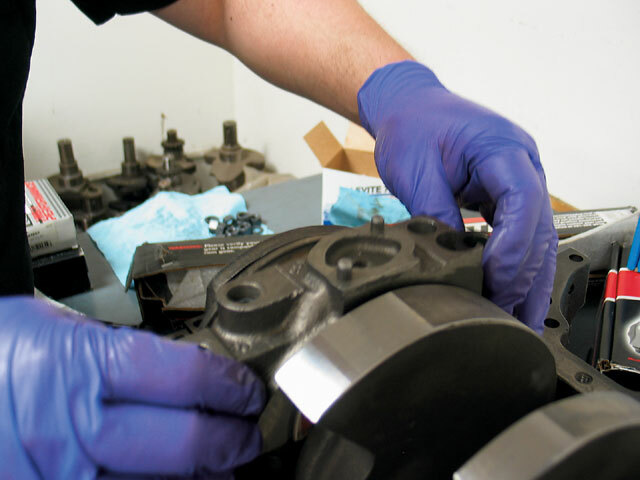 For instance, Jerry showed us that with a big-block you have to grind down the edges for clearance where the connecting rods could hit the wall. Other than that modification, this engine went together very similarly to a small-block. We were very surprised as he put together this long-block in just a few hours. We talked about doing a 502 build tech, but opted to show you how to build a 454 before jumping into the bigger projects, as there’s more 454 cores to work with versus the newer-style engines. 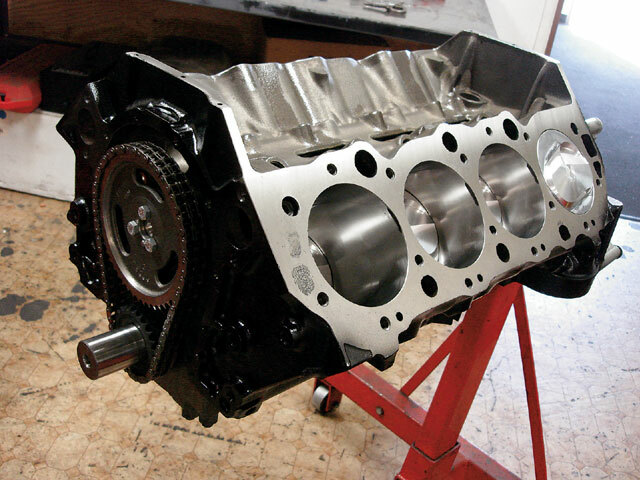 Now follow along as the Jerry of Ace Machine shows us how to put together a 454 long-block. This 454-c.i.d. 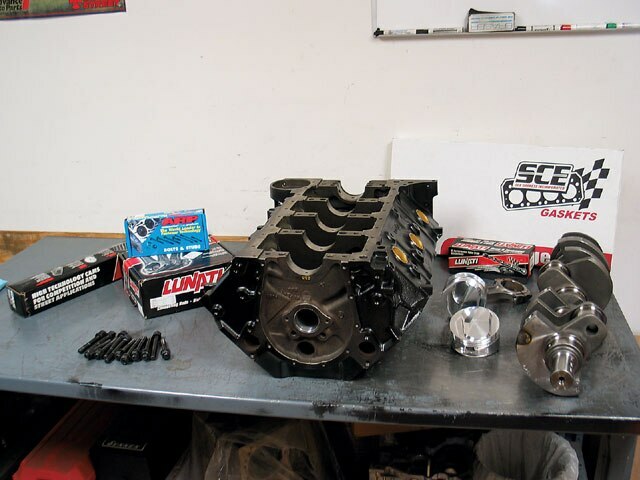 big-block engine was ready to be put together. Jerry started off by installing the cam on the block. His method avoids doing damage to the lobes on the cam while installing. The cam was lubed with assembly lubricant to help protect it when the motor fires up dry for the first time. A Phillips screwdriver was used to push the cam into the final position. 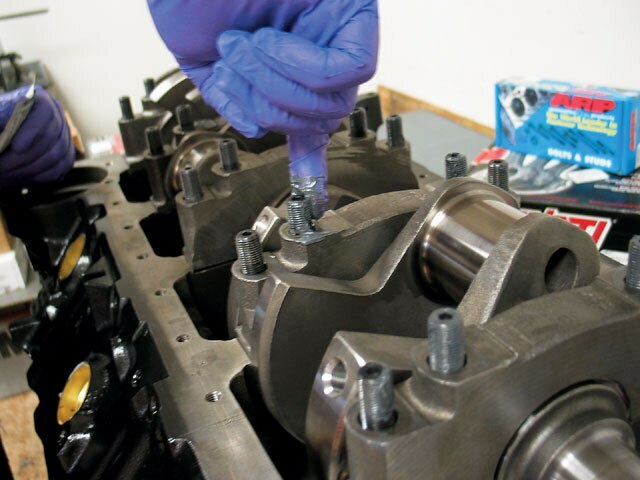 The crank was blown dry after being washed down to make sure that there’s no debris on it and also help take off the protective coating that manufacturers put on the parts to increase shelf life. In the following step we screwed in the main bearing tie-down studs that hold the four-bolt bearing caps. 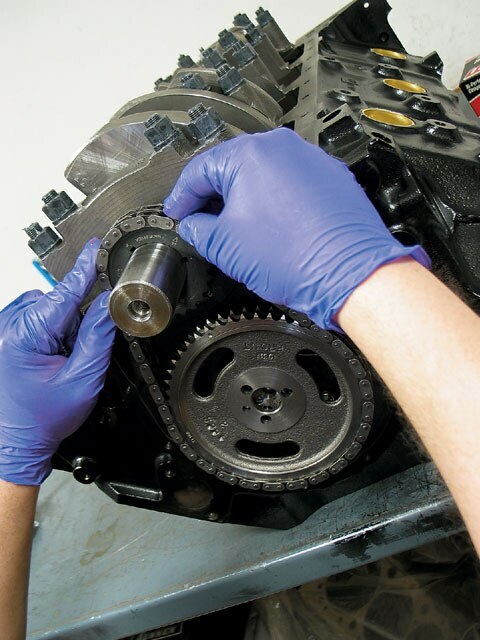 Only the big-blocks come with four-bolt caps on the crank as these engine blocks are designed to endure more stress. Here’s a view of what we’re taking about in regards to not damaging the cam. 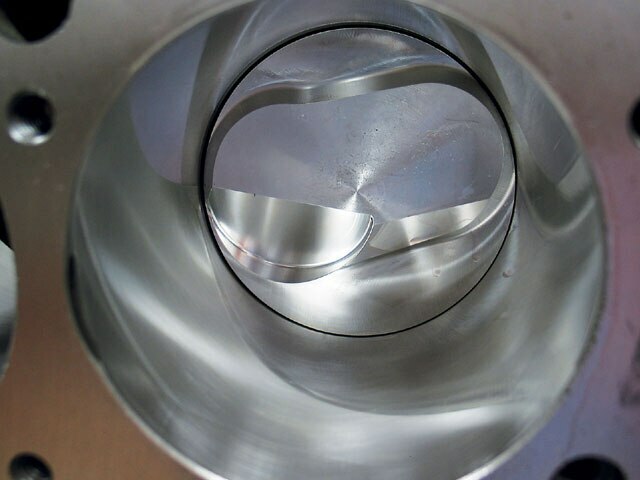 As you can see, there’s nothing in the way that would do harm when you start off by installing the cam. The bottom end was ready to have the bearings put on. 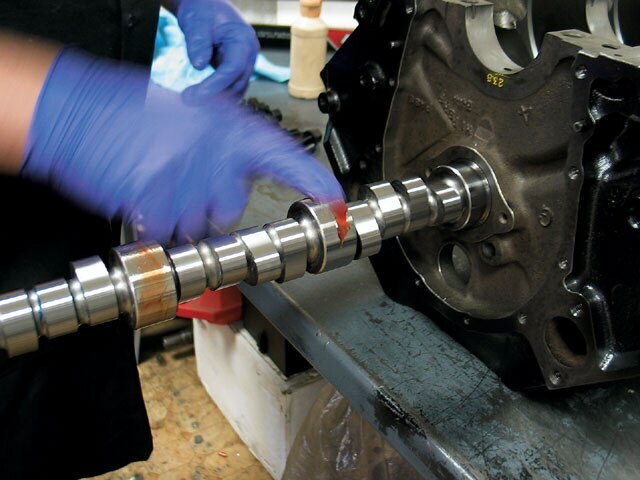 The bearings were placed into position and left ready for the crankshaft to be dropped in. 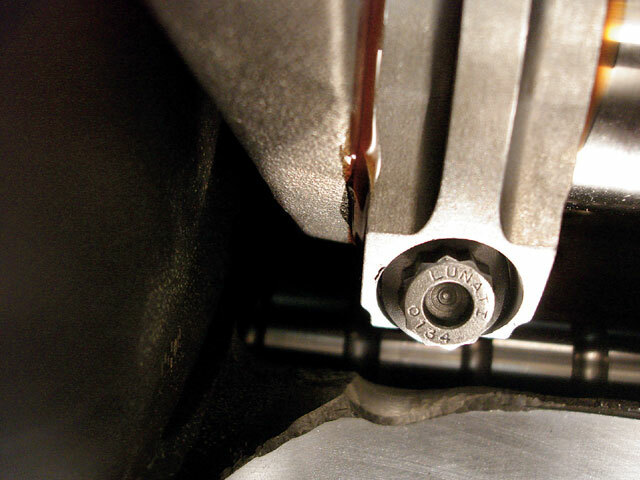 The crank was carefully laid into position to avoid banging it up while being positioned as it’s easy to mar the bearings. The bolt studs were tightened down and left ready for the caps. As the caps were being put on, they were lubed to help protect them from the initial start up. 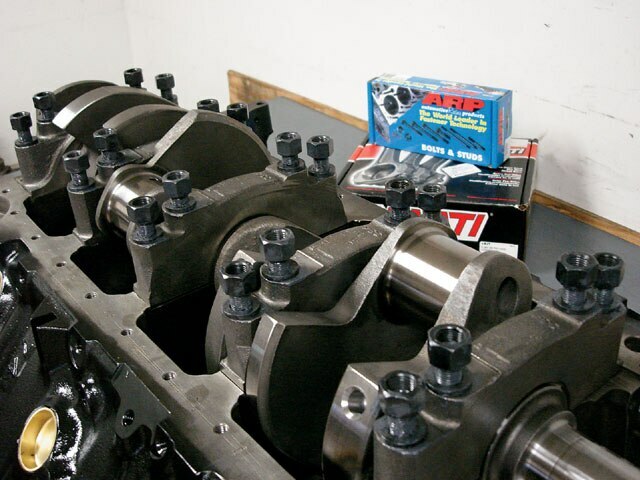 All of the studs were lubed with ARP moly lubricant, which allows you to torque the bolts evenly. 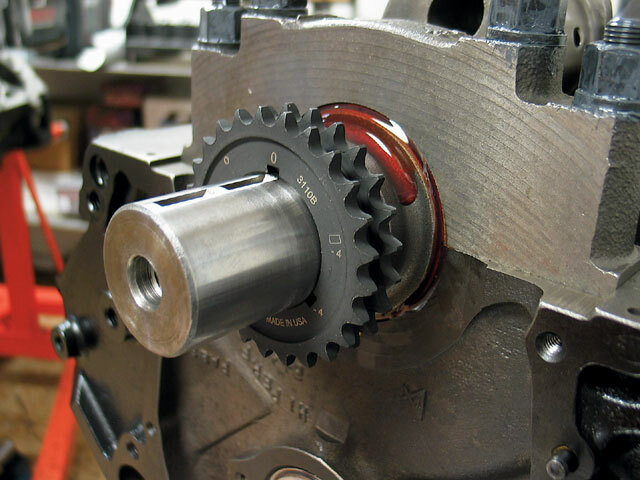 The small sprocket should slide right onto the crank and lock into place with the key. All of the bearing caps were tightened and ready to be torqued. 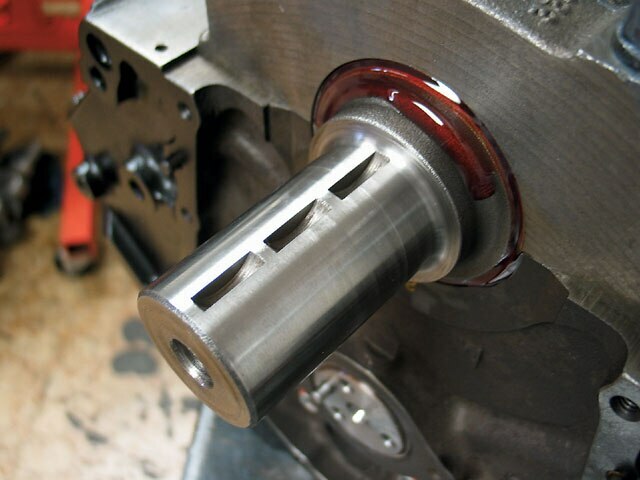 Jerry made sure that all of the piston seals were to the tolerances that he requested for the 60-over pistons. The main bearing studs should be torqued down to 90 lbs, as this engine will produce some major torque and the crank needs to stay lined up. 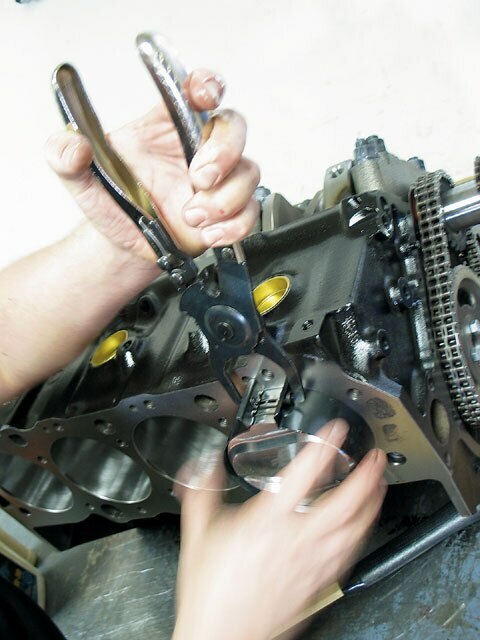 The crank needed a key to allow the timing chain to go on. The caps were then placed on the crank. The studs were all hooked up with nuts to tighten down the bearing caps. The sprockets were lined up and the chain was slipped over the crank and bolted on. The pistons were cleaned and prepped. 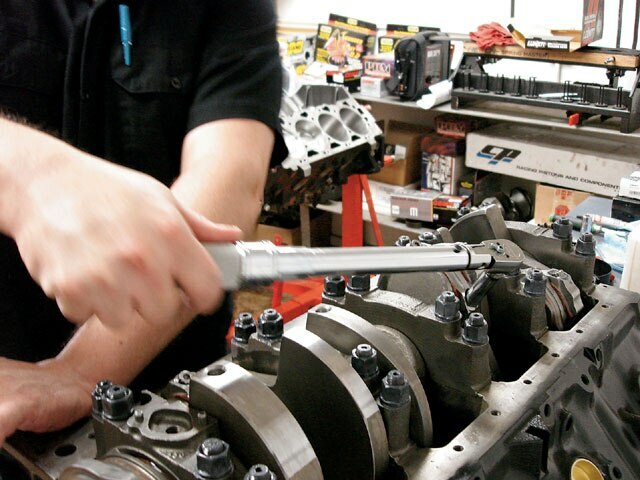 As you can see, the bearing’s hugging the crank and the key’s being tapped into place. Each of the pistons and connecting rods were assembled individually before being bolted to the crank. 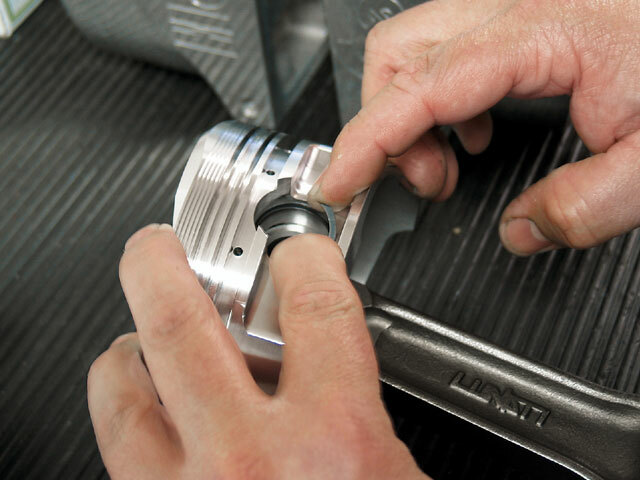 Spiral locks keep the piston pins in place and are used in pairs on both sides of the piston. 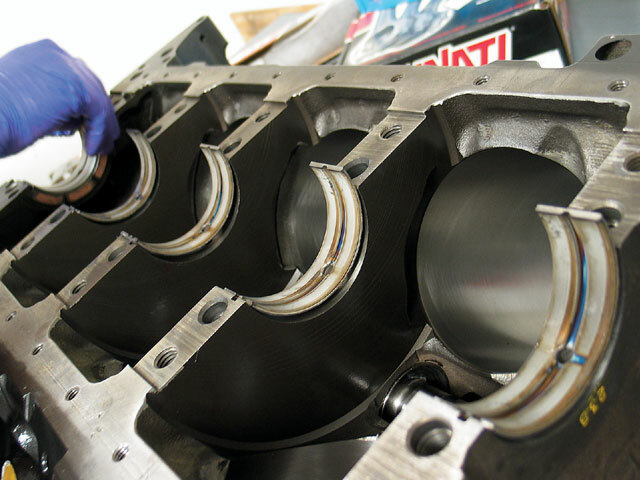 The rings and seals were put on the piston as they’re ready to be dropped in. 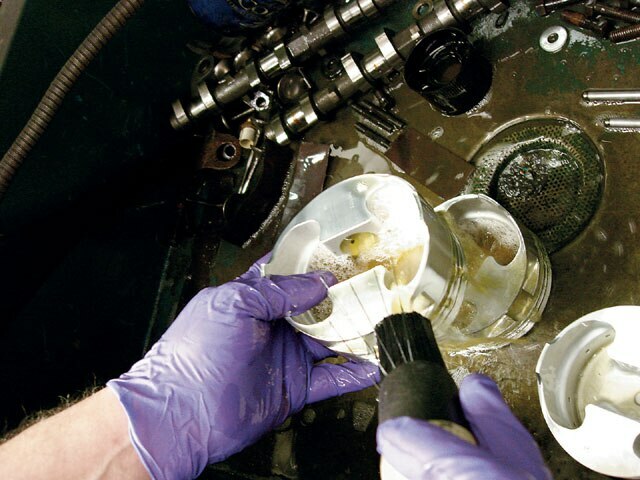 The pistons that went into this 496 were forged-dome pistons designed for running on 91 octane. 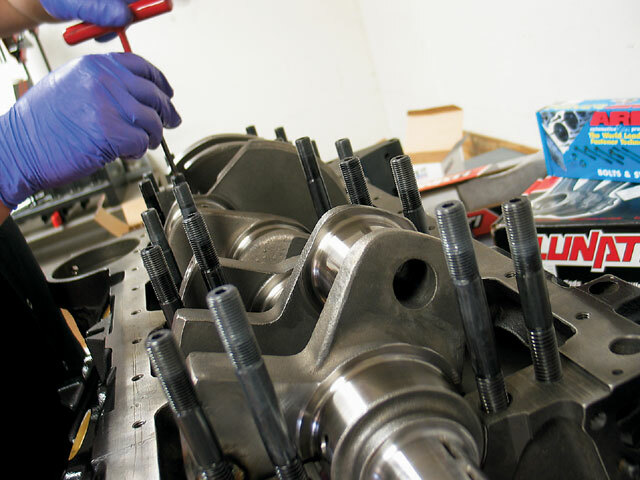 After installing the pistons, the crank was ready to be torqued down. 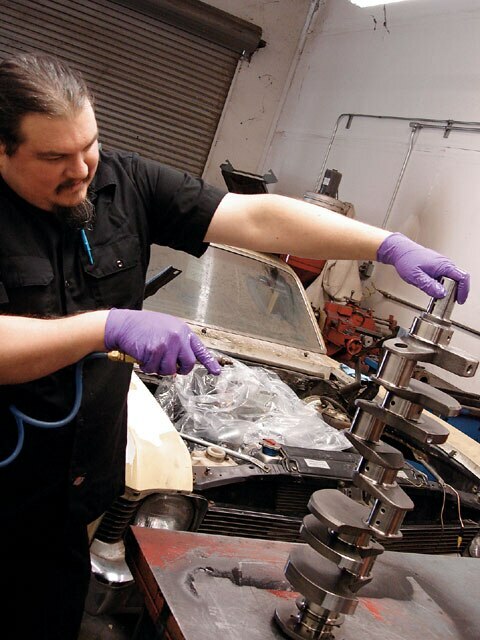 The torque was set at about 65 lbs and was the last major thing that had to be done to this long-block. 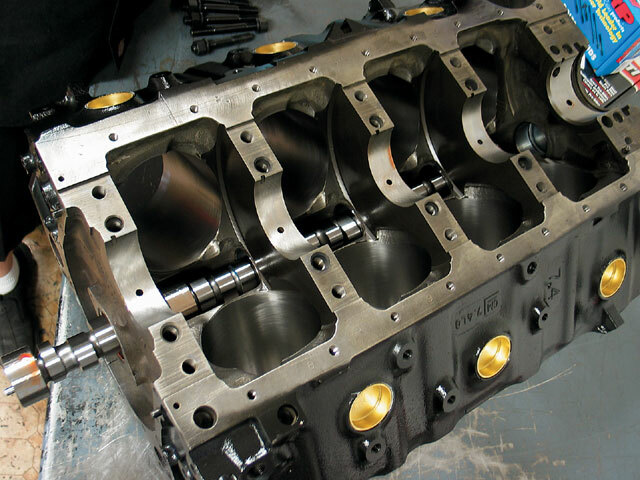 This long-block’s ready to be topped off with whatever combination of heads and intake we come up with. 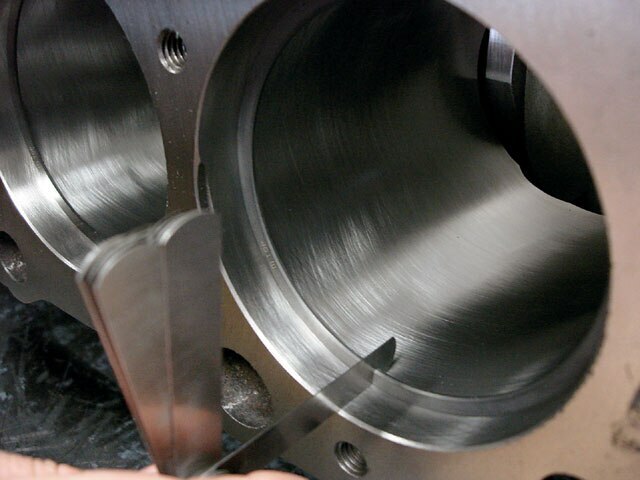 The piston walls were wiped down and felt for smoothness before installing any of the pistons. 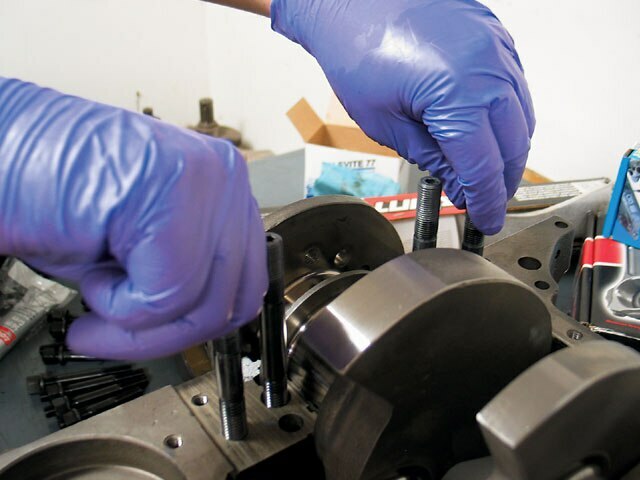 A piston clamp allows Jerry to compress the piston ring and push it through the wall of the engine. 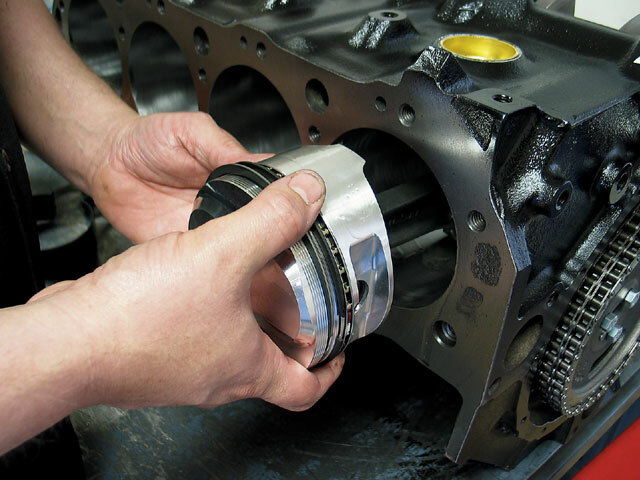 One of the advantages of a big-block is that you only need minor adjustments to make it a stroker motor. 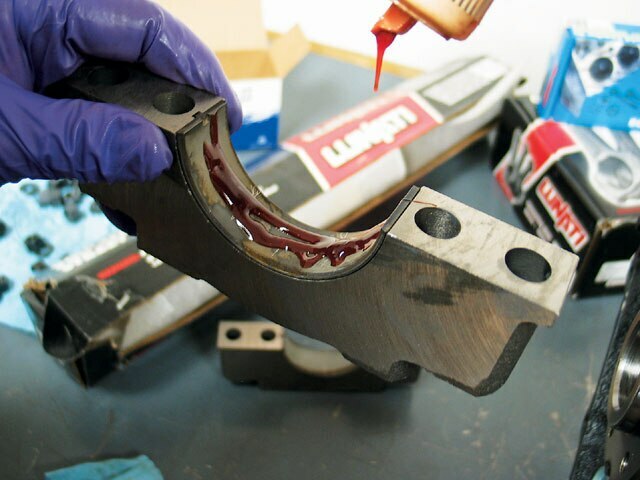 In this case, you can see how much had to be modified to allow the connecting rod to travel freely. 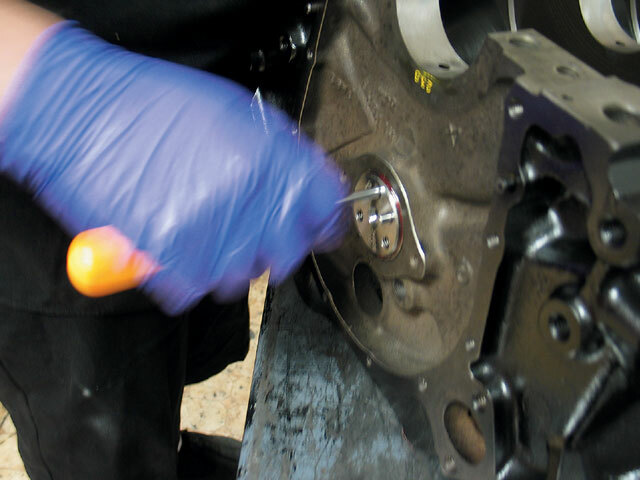 Before putting the long-block on an engine stand, the necessary holes were plugged. 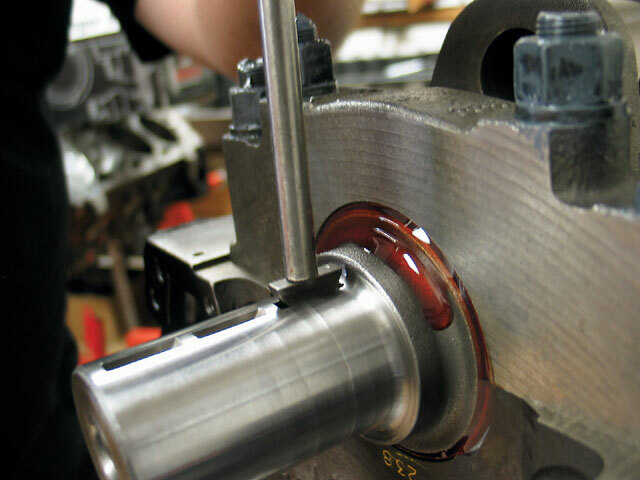 The end of a wood-handle mallet was used to push the piston through without damaging the top of the piston.